Full size, extra capacity vampire chalice drink goblet - Holds 14 ounces of your favorite evil beverage! Entrancingly detailed creepy gothic plastic goblet is a spooktacular addition to any scary or renaissance theme costume party, setting an eerily festive mood. With its ghoulish castle dungeon-inspired Stem, it is the ultimate display for the most refined Halloween table. Solid black with TOXIC screened design phrase, add this classic bell-shaped glass to your creepy crypt decor. No need to worry when your clumsy guests can't hold their liquor. Throwing a costume party and want everything to be perfect down to the cups your guests drink out of? If so, this Black Gothic Goblet is just for you! 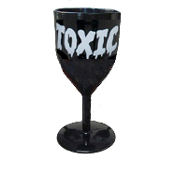 This drinking vessel is sure to be a hit with your guests and will go perfectly with your scary witch, vampire, medieval, alchemy, castle or other themed event.